Precision Feedscrews specializes in solving your wear problems. We offer a wide variety of hard surfacing materials, coatings and base metal encapsulation. Our goal is to provide solutions that best fit your needs. We offer Colmonoy® 56, 57, 83, and 88 and Stellite® 1, 6, and 12 for both new and rebuilt outer diameter surfaces. 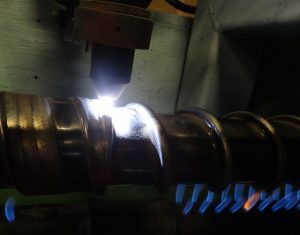 Welding is done with automatic Plasma Transferred Arc Welders to provide a weld of the highest integrity and minimal cracking. We also utilize MIG and TIG welding for repairs to damaged feedscrews. We can encapsulate the screw root with hard surfacing where needed to reduce wear. Several different materials are available for this purpose depending upon the need and specific situation. We work with many companies to provide coatings that protect against wear. We also offer industrial hard chrome plating and electroless nickel plating.